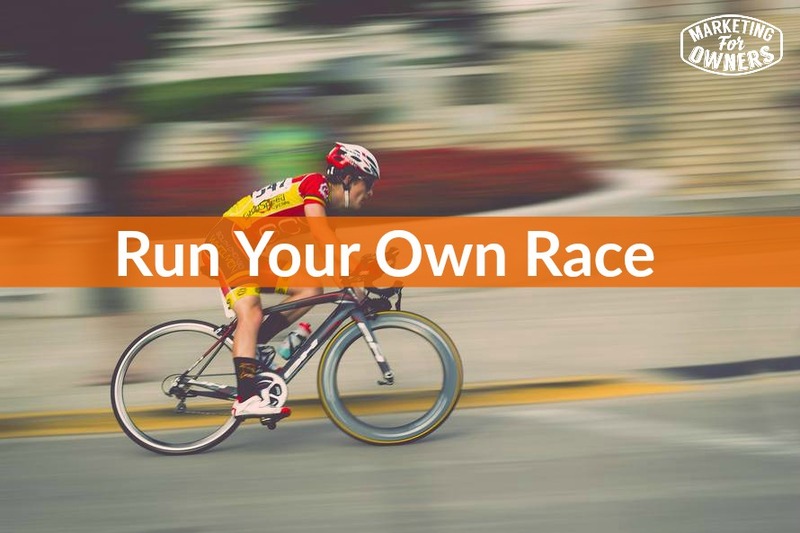 Today I’m going to advise you to run your own race. Now that’s another Olympics inspired title. And the inspiration came when I was watching the Cycling pursuit race. Now if you don’t know what that is, it’s where a line of 4 cyclists in the men’s at least, they go around the track with palindrome inside. And they just go round and round for a few thousand meters at full speed, and they kind of slip stream each other. And they swap in front. It’s all clever stuff. And they try and catch. One team starts on both sides of track and they try and catch the other ones. But what happens is, sometimes one of them can go out very fast. Much a bit of a surprise for the others. Now do the others then change their tactics to react or do they, as in the case being British, the great British team, the Great Britain team who win the gold medal virtually every time. Or do they stick to their game plan. And this is what I want you to think of in your marketing. So it’s all down to planning and strategy. The most important thing in your marketing bar none is to have a strategy, and a plan, and then goals. That means that you are doing something based on your strategy. That means that no matter what your competition do, or what other people say, or how things change, unless it’s something incredibly dramatic, you should see through to the end of your plan. Because when you set it, it all makes sense, you analyzed it, it’s all sensible, it’s all going to work out. So you should not then be swayed by what others do. You should stick it out, follow it through, get to the end. See the end game. And that’s what happens with those cyclists. In a few cases, so they planned out to build a strategy to follow a time around the track so that they would beat the world record. Now sometimes, the opposition, knowing the British team were better would go out with slightly different strategy, and go out fast. So they would appear to be ahead. The British team know that the opposition are not capable of going that fast. And they will tire. They have the confidence in their strategy. They stick it out. They don’t panic. They see it through. They win. And this is the same with yourself. So many other people start, so many people in business, they start doing something and then see what someone else is doing and think, ‘Aahh! Gosh, that looks great. We should do that.’ But that’s the same as the old internet marketing is looking for the new shiny object, the newest thing. The latest fad. It’s just simply not needed. Don’t worry about it. Just stick to your game plan. And this will apply on everything. Your goals, if you’re thinking, ‘Well hang on, what if something major changes,’ well your goals are, you are going to have long term goals and then they are going to be broken down into shorter term goals, to get there. So as you’re pushing these shorter term goals, which may be one month at a time, they maybe 90 days. Once you achieve those, then you can review what you have just achieved and you can review where they fit in with a longer term goal. So for example, a one year goal should be broken down into 90 day chunks. That’s 4 of them to achieve. Because a one year goal is going to be difficult. It’s going to be overwhelming. Break it down in 2. Reverse engineer it down into 4 quarters. And then reverse engineer each quarter into 3 monthly goals. And to see where you are, and to see if you are progressing and getting them. So after those 90 days, you can review it. You can look at what someone else has done or doing. And you can think, should that effect what we’re doing long term. It maybe something you’re doing online, it may be effected by what google does, or Facebook does, or change like that. In which case that’s the time to review it. But don’t interrupt what you’re doing. Get to the end, complete and then do this on the review. Okay. Simple as that. I’m keeping this short and sweet today, because I got something cooking in the oven. And it will be ready in a minute. Today is Thursday, so it’s time for a drive time podcast. And this one’s going to be slightly different. This is by gentleman called Jerry Colonna. It’s the Reboot podcast. Their website it is at www.Reboot.io and it involves sort of startup leadership. So it’s quite inspiring. It involves startups, involves, consists of winning and losing and ups and downs. And he interviews people, I think its weekly, comes out about 40 minutes or so, very very good quality. Good chat. But he talks to people about the ups and downs about, so it’s not all about the success. It’s about how people get there and it’s the real life. And that’s what I like about it. Its real life, down and dirty. What can go wrong, what can go well? But real life, so it’s quite inspiring, I find. Also, tomorrow Friday, we have a super one for you. In our Ones to Watch, she is British, she is wonderful. Her name is Sarah Williams. She has won awards for her podcast. That’s where I met her, she is great, she has tough girl challenges and it’s very very different. Her business is very very different from anything I’ve seen before. And I think it’s wonderful. And her job, or what she does is to inspire girls and women to do more. And to further themselves. And what a fantastic thing to do. So listen tomorrow. 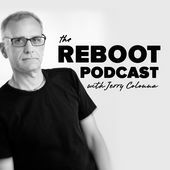 Check out the Reboot podcast. But tomorrow check out our Ones to Watch Friday Edition. There’s one every Friday and Wednesday is the Expert Interview Series. And then have yourself a good weekend. After that I’ll be back on Monday.